Here are what I think are three clever uses of math by students. 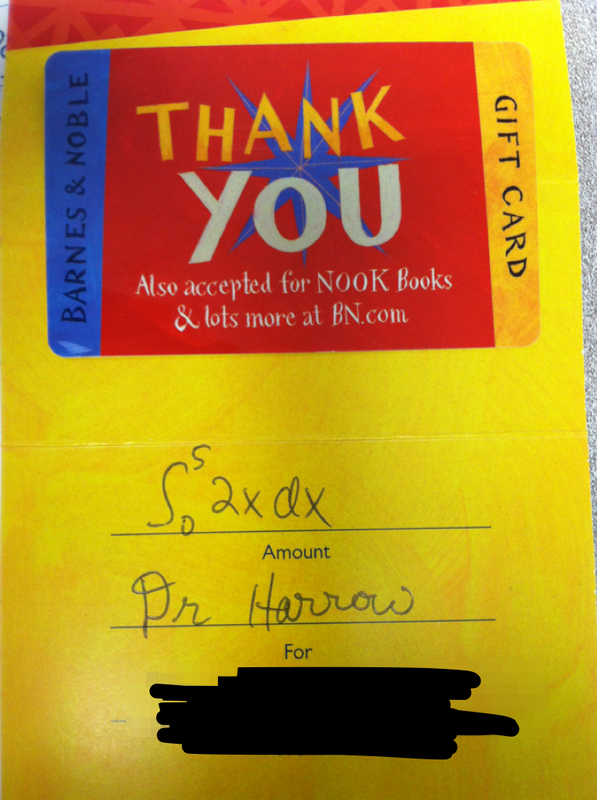 This was a gift certificate I received from a student last month from a graduating senior. 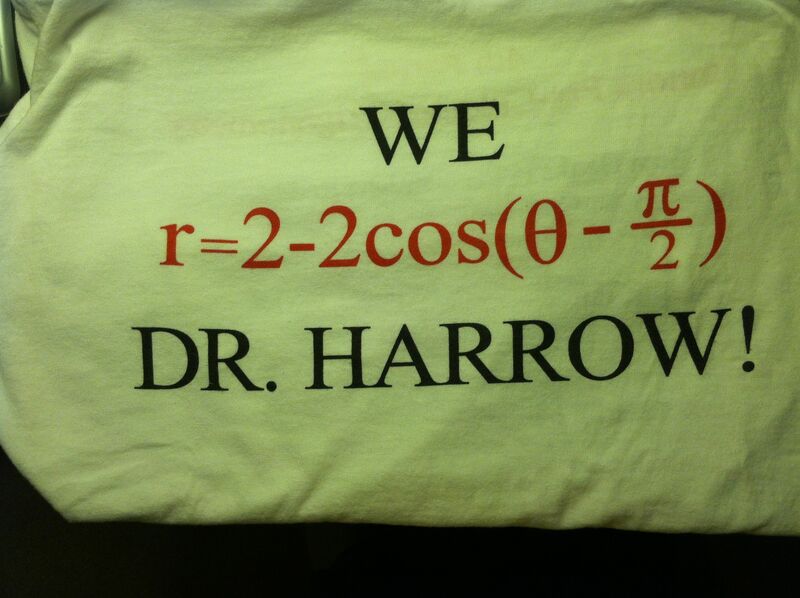 In my last week of classes at my former school in May, 2013, my entire Honors Precalculus class showed up wearing these shirts designed by one of my students, M. The back listed all of the students and a lovely “We will miss you.” As much as I liked the use of a polar function, I loved that M opted not for the simplest possible version of the equation ( ), but for a rotation–a perfect use of my transformations theme for the course. Now for a throwback. 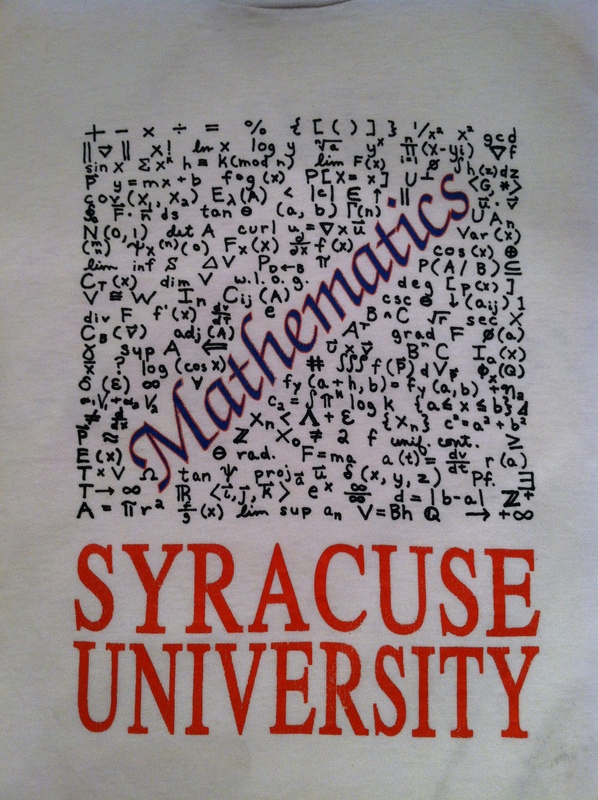 When I was a graduate student and TA at Syracuse from 1989-1990, one of my fellow grad students designed this shirt for all of the math and math ed students. I don’t remember who designed it, but I’ve always loved this shirt. Over the past few days I’ve been rethinking my sequencing of introducing derivative rules for the next time I teach calculus. The impetus for this was an approach I encountered in a Coursera MOOC in Calculus I’m taking this summer to see how a professor would run a Taylor Series-centered calculus class. Historically, I’ve introduced my high school calculus classes to the product and quotient rules before turing to the chain rule. I’m now convinced the chain rule should be first because of how beautifully it sets up the other two. Assuming you know the chain rule, check out these derivations of the product and quotient rules. For each of these, and can be any differentiable functions of x.
QUOTIENT RULE: Let . As before, apply a logarithm, differentiate, and rearrange. I’ve always emphasized the Chain Rule as the critical algebra manipulation rule for calculus students, but this approach makes it the only rule required. That completely fits into my overall teaching philosophy: learn a limited set of central ideas and use them as often as possible. With this, I’ll still introduce power, exponential, sine, and cosine derivative rules first, but then I’ll follow with the chain rule. After that, I think everything else required for high school calculus will be a variation on what is already known. That’s a lovely bit of simplification. I need to rethink my course sequencing, but I think it’ll be worth it.